00:48:00 Makes 6 servings, 1 cup (250 mL) each. Risotto is a restaurant favourite that is easily made at home. 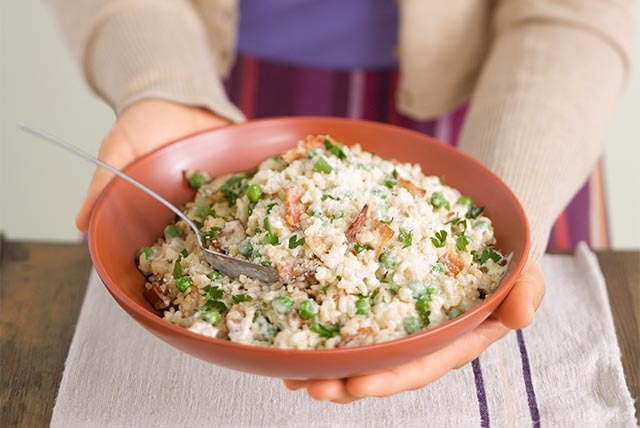 Don't be daunted by this classic Italian rice dish - just follow our 3 simple steps and you'll be enjoying our Bacon and Sweet Pea Risotto in no time. Cook bacon in large skillet on medium-high heat 5 min. or just until bacon is crisp, stirring occasionally. Remove bacon from skillet with slotted spoon, reserving drippings in skillet. Drain bacon on paper towels. Add onions to drippings; cook on medium heat 3 min. or until crisp-tender, stirring occasionally. Add rice and garlic; cook 3 min. or until rice is opaque, stirring frequently. Gradually add 2 cups broth; cook and stir 3 min. or until broth is completely absorbed. Repeat with remaining broth, cooking and stirring rice 17 to 20 min. or until al dente (tender but still firm) and adding cream cheese with the last addition of broth. Cook 5 min. or until cream cheese is completely melted and mixture is well blended. Stir in peas; cook 2 min. or until heated through, stirring occasionally. Remove from heat. Stir in bacon, parsley and 1 Tbsp. Parmesan. Serve topped with remaining Parmesan. Prepare using medium-grain white rice.